A state district judge has ordered David Wilson to refrain from taking an oath of office to serve as trustee of Houston Community College System District II until a court can determine the issue of his residency. Judge Elaine Palmer granted the application filed by Harris County Attorney Vince Ryan asking that David Buren Wilson be prohibited from being sworn in until a court can hear evidence about where Wilson actually resides. Harris County Attorney Ryan filed suit last week in the 151st District Court questioning whether Wilson was a resident of Houston Community College District II at the time he was elected. The judge set a hearing for January 10th at 3 pm. Harris County Attorney Vince Ryan said it is unclear if Wilson resides at 5600 West 34th Street., which is the address he used in order to be eligible to run for the college district’s Place II position. Wilson’s attorney, Keith Gross, questioned what is motivating the probe, including whether other board members fear Wilson will uncover corruption in their ranks. He said his client, a 67-year-old small businessman, lives in an apartment inside the building, gets his mail there and has the address on his driver’s license. I believe that. I believe Dave Wilson will appeal this to the end of the earth and back again. I hope you know what you’re in for, Vince Ryan. Because Dave Wilson can’t be bargained with. He can’t be reasoned with. He doesn’t feel pity, or remorse, or fear. And he absolutely will not stop, ever. Wilson did not return requests for comment, including an opportunity to let a Houston Chronicle reporter inside the metallic two-story building to see his quarters. County appraisal district records describe it as a commercial building with 11,340 square feet of space. It appears to hold at least one classroom and a warehouse area. Ryan, the county attorney, said the building does not appear to have an occupancy permit required for it to be a residence, and might not have undergone proper inspections. Let’s talk about the residency requirements to run for office for a minute. I personally draw a distinction between residency in a district and residency in a taxing entity such as a county, city, school district, or community college district. District lines are drawn on sand. For districts determined by our Legislature, we’re lucky to have two consecutive elections where they’re all the same. As we learned in 2003, they can be changed at any time if the Governor wants them to be changed. People are regularly drawn into and out of various districts for political purposes. I’m in a different State Rep district and a different State Senate district than I was in 2011, and it’s not because I’ve moved. It happens all the time, and while I think it’s a perfectly valid campaign issue, I am comfortable with there being a very loose definition of who “lives” in what district for eligibility purposes. It’s very different for taxes, ordinances, regulations, and other things may apply based on whether or not you live within that entity. If you’re running for a Harris County office, you better damn well live in Harris County. Same for Houston and other cities, HISD and other school districts, HCC and other community college districts. We just had a Mayor’s race where that was a salient issue, as it should have been. I don’t need anyone to be a native of these places, or even to be a longtime resident. I just need you to have the same skin in the game I do, and for this I don’t tolerate shenanigans. That’s why this matters for Dave Wilson. The key point of contention is that Wilson actually lives outside of HCC’s territory, in a house on 7370 Lake Lane that is listed on the property tax rolls in the name of his wife, Connie. That house, which is in the taxing region for Lone Star Community College, has a homestead exemption on it, as you would expect for a primary residence. If that is where Wilson really lives, then he has no skin in the game by my lights and thus has no business running for HCC Trustee at all. It would have been best to deal with this before the election, but the fact that Bruce Austin was too incompetent a candidate to raise the issue in time shouldn’t mean that Wilson gets a free pass. Permits and inspections are one piece of evidence, but we all know that there are plenty of homes in Houston for which that paperwork isn’t in order. So show me that 5600 W 34th St is really someplace someone would live. Show me that it’s got a bed, a shower, a fridge, a microwave oven, and a hookup for cable, satellite, or the Internet. Actually, show me that it has at least three beds, because if you do a voter registration search by address for “5600 w 34th”, you get three registrations, one each for David Buren Wilson, Cameron Hunter Wilson, and Taylor Renee Wilson. Are there really three people living there? If so, I will withdraw all my objections and will urge County Attorney Ryan to drop the lawsuit. Maybe Wilson will let Lisa Falkenberg drop by and see what she thinks. For what it’s worth, I found no registrations at 7370 Lake Lane. One more thing. As I noted before, up until at least 2011, Dave Wilson had been using a different warehouse as his “home” for voter registration purposes. That warehouse was at 1512 W 34th, which is down the street a little less than three miles away. Why would he “move” from one warehouse to another? There’s one obvious answer to that question. To check that answer, I went searching for voter registrations at nearby addresses. I found one that’s just around the block from Wilson’s old digs. 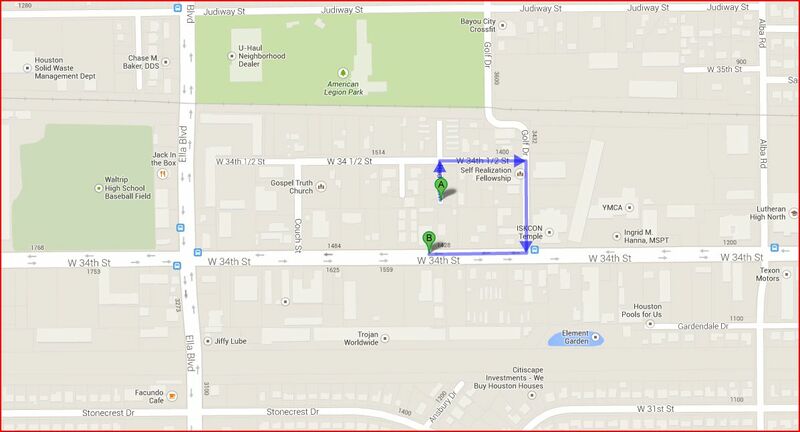 Here’s a Google map of the area, and a screenshot of the two together; A is the neighbor and B is 1512 W 34th. Lo and behold, Wilson’s near neighbor is in HCC District 1, not HCC District 2. That’s why he changed his registration from one warehouse to the other. He had to so he could target the HCC District 2 seat. If that were the only issue, as stated above I wouldn’t care. 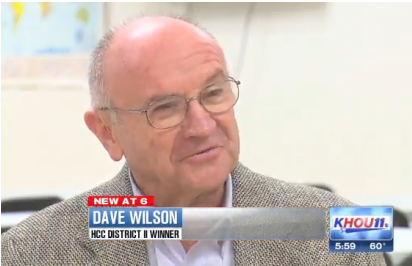 But if Dave Wilson really lives in the house on Lake Lane, he’s not eligible to run for any HCC Trustee seat, and it very much does matter to me. We know this isn’t the first time Wilson’s residency has been questioned. Let’s get this sorted out once and for all. its not about dave wilson anymore kuffner=its about the voters that voted,vince ryan should not try to invalidate their vote=no matter where dave wilson lives at this point=the ballots have been cast=bruce austin took his districts tax dollars and sent it over seas,thats why bruce austin got smoked off on his dusty by the voters=as for vince ryan=hes playing god and i would caution him when he moves against democrat voters=he shouldnt be playing god when it comes to elections=he should move up to canada or retire one=i really think vince ryan should resign………………. Whatever the rule of residency is, it should be applied equally to all the local officeholders who do not really live in their districts. And my view is that complaints about residency ought to be resolved before elections, not afterwards. The law is fuzzy precisely because there are lots of folks whose lives do not fall neatly into what most of us understand as residency/domicile. College students, soldiers, diplomats, oil company workers deployed abroad, folks wandering the nation in an RV. All of these should be entitled to vote and participate in politics somewhere. I am amused by the “skin in the game” argument. Reminds me of the old ideas that only property owners or taxpayers should be allowed to vote. Only the literate, etc. Perhaps a better way to phrase the inquiry is whether a prospective officeholder cares about and is a part of or affected by the decisions of the community. Under such a flexible standard, Wilson, like Kubosh, MJ Khan, Christie (first campaign), the late Gallegos, and a host of others would all qualify to serve in office. I don’t see a problem with holding office seekers to a higher standard than voters. We already do it for a lot of other things. By your standard, someone who lives in The Woodlands could run for Council or Mayor. I don’t care for that. Yes, it would have been better to settle this before the election. But it’s precisely because this area of the law is so fuzzy that I’d like to get some clarity on it. If the Legislature wants to weigh in on it next year as well, that would be fine by me. We need to have a clearer picture of what the rules really are. It is easy to make up “facts”. There is a bed, there is a stove, there is refrigerator, there is private bath. But don’t let facts confuse the author simply because he does not like someone. Why not look as to how many people vote from that small house that belongs to State Rep Armando Walle? By the way those two people that the author of the article mentions, one is in college, not in Harris County and one is in the armed forces defending people like the author to make up “facts”. HCC legal counsel dropped the ball on this one. Destinee Waiters, acting General Counsel, did not do her homework which was to vet Dave Wilson when he turned his paperwork to run for the District 2 trustee position. Acting Chancellor, Renee Byas, who was the previous General Counsel and now supervises Waiters, should have done a better job to manage this department. All in all, HCC legal counsel department is incompetent and they should be held liable for this mess. Acting Chancellor needs to step down. Why is it that folks seem to be afraid of the truth being the standard here and in AMerica, when there is a dispute, it is heard in a Court of Law. Seems that all that has been done is a judge put a temporary hold on the ceremonies so all the facts could be vetted. What’s wrong with that. Maybe putting people under oath and actually examining what is or isn’t will get to the bottom of this. I trust a court of law and our American system of Justice a lot more than I trusted all the ranting and raving by apologists or those with a vested interested in the outcome…and that means folks on both sides of this issue. Chill out….I for one don’t give a tinkers damn if there is a cot or three bedrooms or even a flush toilet in the building. The law is the law….and that’s what we are about to use to find out real facts. In the end, whoever is sworn in at whatever time deserves to serve without a cloud hanging over them for six years….and the people of the district deserve to know their representative is legit. My personal congratulations to County Attorney Vince Ryan for pursuing this matter after it was brought to his attention. He’s doing his job that he was elected to do. Manuel, why do all of the permits for that building say “non-residential”. Why does the company that owns the building have trouble staying compliant with state law (it’s not in good standing with the Secretary of State, and has a history of that that can be seen at http://www.wysk.com/index/texas/houston/f3cbpvp/d-s-w-equipment-inc/profile). You would think that a great business man could keep his state tax filings current. Why do you bring up other situations that we aren’t discussing here? There may be too many people voting from Rep. Walle’s property, but what does that have to do with Dave Wilson? Should Dave Wilson get a pass because someone you don’t like is doing something wrong too? Manuel Barrera can’t read or write. He also claimed he was responsible for running a shady campaign for Wilson. Really Gary, Manuel can’t read or write. I guess I could make that same statement about you as it seems you did not read everything that Kuffner wrote. Ross a corporation and individual are two different entities. DSW Equipment is a corporation, Dave Wilson is an individual. Ross the only persons that seem to have problems, as their hate seems to cloud their ability to reason, are Gary and Ross. Let me translate for you two, Kuffner wrote that three people were registered to vote at 5600 W 34th so he wanted to see three bedrooms. I pointed out that in fact there are three bedrooms. In reality there are five rooms excluding the restroom that are in the apartment. So there could be four bedrooms if used as such. One of the rooms is a kitchen with stove, frig, etc. I, additionally, pointed out that State Representative Walle has more people voting from his small house, six people are registered to vote there. Why would I say that because it seems that the number of bedrooms must correspond with the number of people voting from a location according to Kuffner. If Vince Ryan is going to question residency I have a list of Democrats that need investigating. A few others from HISD, HCC, and other non partisans elected offices. Fair is fair, the County attorney needs to investigate all of them and move to oust them from office. He should also look into collecting the money that State Representatives Miles and Dutton owe in back property taxes and that is just the tip of the iceberg. Ross I don’t understand how permits are issued, but it is my understanding there was a mess up when the building got remodeled. Geez whiz – not only Barrera can’t write – he babbles, too. Kuff, I agree with you about residency. But I can’t abide the hypocrisy of the selective enforcement and journalism that is taking place. For years, you and the Chronicle have done an abysmal job of reporting this clear and repeated attack on the public trust for decades. Why have you not addressed where where Rep. Wu really lives, certainly not in the SW/Sharpstown area that he represents. Why not report where Rep. Vo lives and where his children go/went to school. (In his case it is double whammy as his representation is based more on community than geographic considerations.). Where was the reporting on Sen. Gallego’s long homeownership outside his district. MJ Khan, Ben Hall, Jack Christie, etc., the list goes on, not that the Chronicle or you ever mentioned it. The solution has always been the same. Simply report it early, let the voters know and enough politicians would get busted… fewer would then dare to flout the rules. It probably wasn’t right how Wilson won, but HCC deserves better than Austin and if the District was that gullible, uninformed or biased, they are reaping what they sowed. The lack of reporting, particularly honest, straightforward, impartial reporting is how corruption begins. He take a few bucks here, wink wink, lives here, wink wink, cuts a corner here or there, wink wink. Thats how they did it in Detroit! Your stated exceptions is this case are a thin justification for the fact that Democrats, and you as a prime lackey, want to make the Wilson story an ongoing issue, with racial and LBGT overtones, for future elections. The one time it was really reported, it was when Republican Rob Mosbacher ran for Mayor against Dem. Lee Brown. And Mosbacher legally complied. Compared to too many politicians, Wilson’s apartment set-up is almost a paragon of propriety. Mr. Wilsons residence is not the issue and we all know it. Why did Ryan choose Palmer’s court for the filing of the TRO? And why no open discussion about required signature on the anti-bribery document? Has some intrepid reporter or blogger sought to obtain copies of anti bribery documents signed by other elected officials ? Why no discussion on how some current office holders who had foreclosure proceedings commenced against them and IRS liens against them managed to get those IRS liens released? At least one question is easy to answer. In the Harris County civil district courts, the judges rotate who hears emergency motions (such as TROs) twice a month according to a published schedule. Judge Palmer heard the TRO because she was the ancillary judge for the latter half of December. A TRO automatically expires after two weeks unless it is extended; generally, a temporary injunction hearing will be set within that time frame. The temporary injunction will be heard by whatever judge the case was assigned to at random when it was filed.